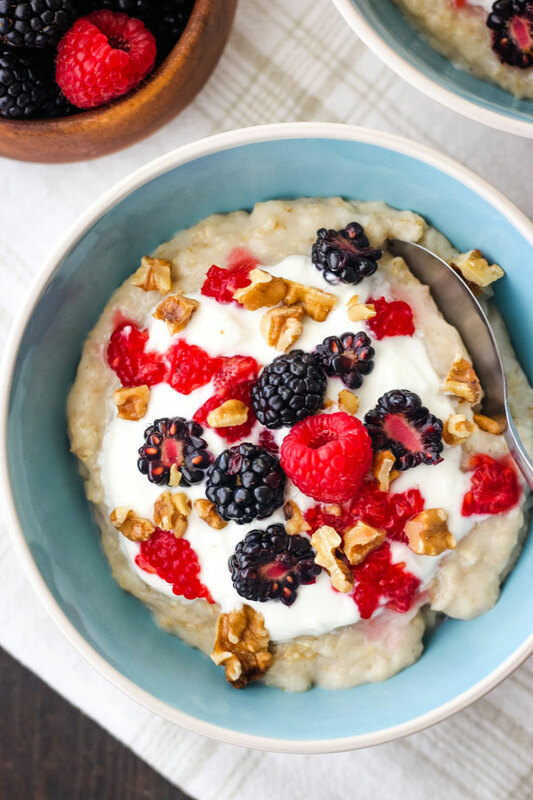 Comforting and filling, nothing beats a warm bowl of oatmeal for breakfast. 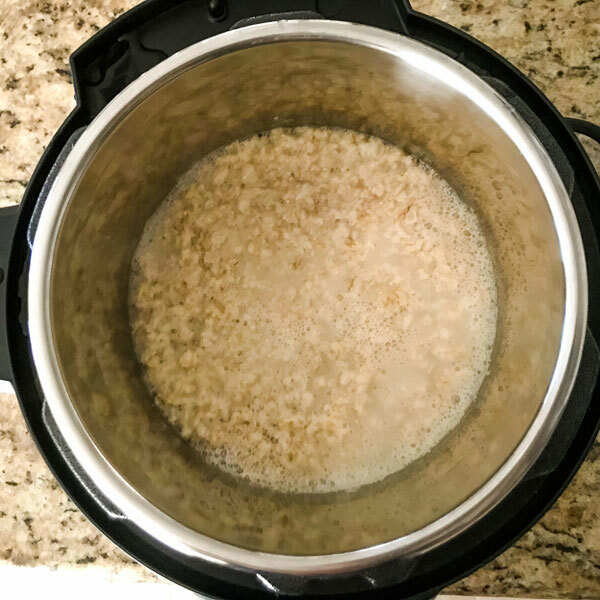 The 3 Quart Instant Pot Mini makes it easy to whip up a batch of oatmeal for two, especially on busy weekdays! 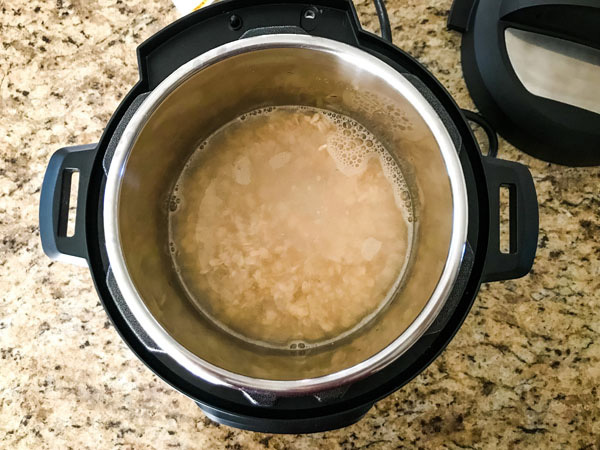 If you’ve never cooked oatmeal in an Instant Pot you’re probably wondering, does the oatmeal cook faster? I won’t leave you in suspense. It does not. First, you need about 2 minutes to pull your ingredients together. Then your machine needs about 10 minutes to build pressure. There’s 1 minute of actual cook time. Lastly, 15 minutes of letting the pressure release naturally. The whole cooking process for our go-to recipe takes about 28 minutes in total. 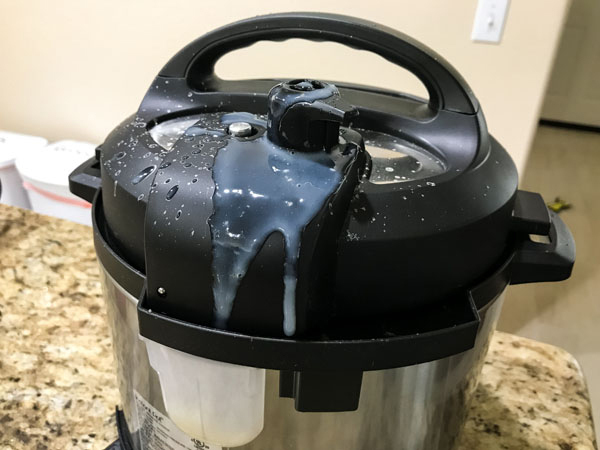 So why would you use an instant pot instead of the stovetop? You don’t need to stir a pot or keep an eye on it. You just set a timer and then get on with the rest of your morning routine. 26 minutes later you smell better, look presentable, and there’s a pot of perfectly cooked oatmeal waiting to be topped and devoured! 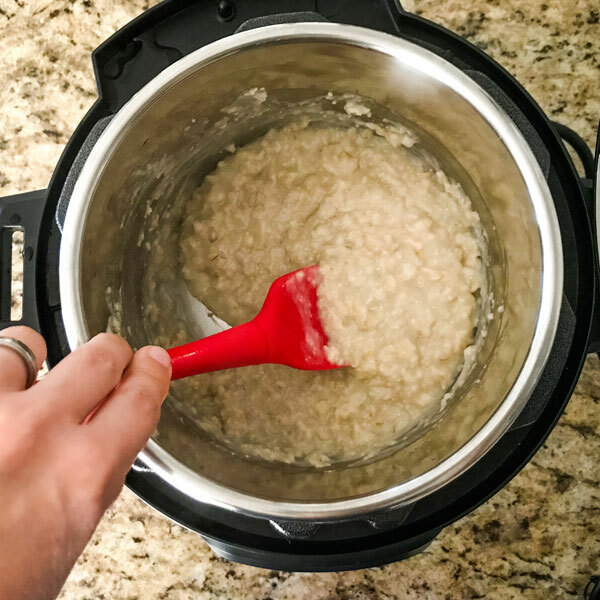 To come up with this creamy Instant Pot Mini Oatmeal for Two, we resized and tried a bunch of larger recipes, kept the best parts of each one and added our own special touches (lemon extract is a game-changer friend). If you like sweet oatmeal, drizzle on honey or maple syrup. 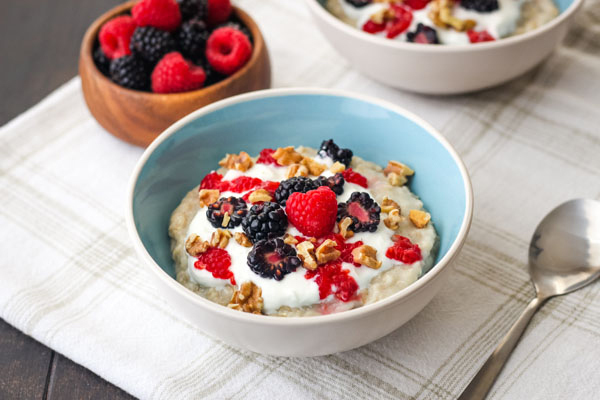 From berries and yogurt to bananas and peanut butter, the topping possibilities are endless! 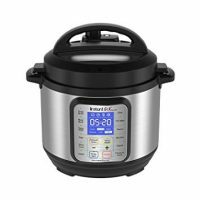 Combine the oats and water in the inner pot of your 3 qt Instant Pot. Close and lock the lid. Make sure the steam release handle is pointed towards the Sealing position. Select the Pressure Cook or Manual button and adjust the settings to cook on High Pressure for 1 minute. When the cooking time is up, wait for 15 minutes. If the float valve has not dropped down, manually release the pressure. Carefully open the lid turning it away from you as you lift it up. There will be a small layer of liquid on top. Stir the contents to incorporate it into the oatmeal. Serve warm with your favorite berries, yogurt, cinnamon, and sweetener if desired. 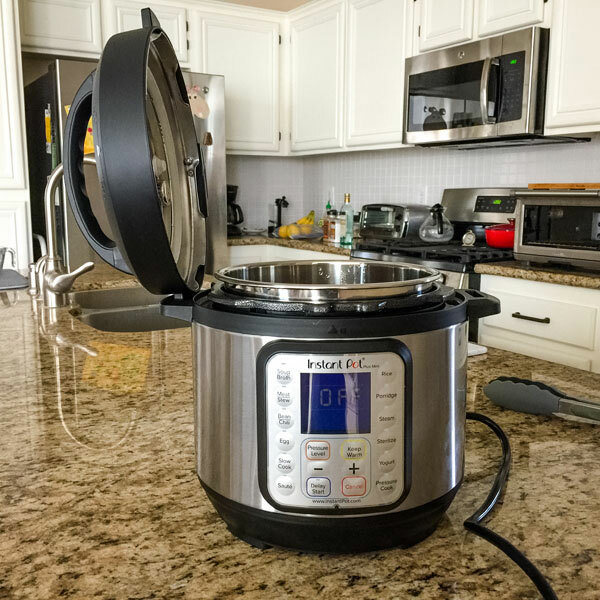 Recipe developed using a 3 Quart Instant Pot Mini Duo Plus. 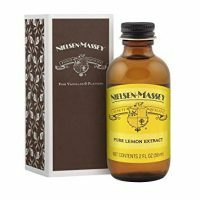 Oatmeal Flavoring Recommendations: Try adding a splash (about ⅛ teaspoon) of lemon or vanilla extract to the water before cooking. A 1/4 teaspoon of ground cinnamon with almond extract is a nice combo too. 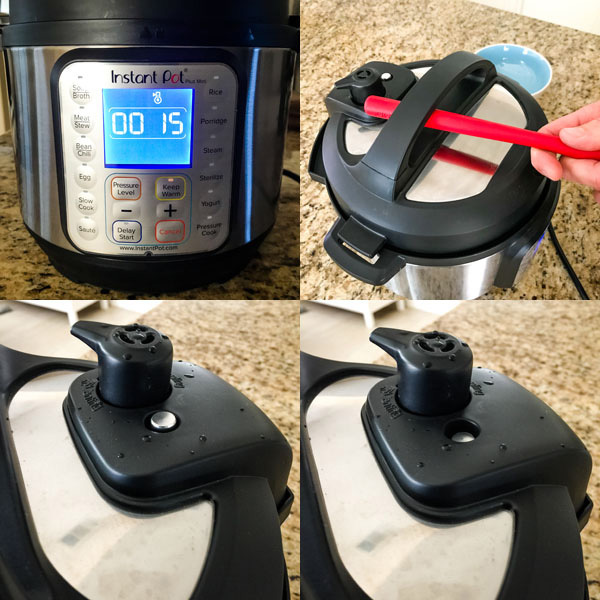 Start by combining 2 cups of water and 1 cup of old-fashioned oats (not steel cut) in the inner pot of your 3 qt Instant Pot. Quick Note: I wouldn’t suggest doubling this recipe. According to the manual, beans and grains create a lot of foam when pressure cooked. To keep things safe, you should only fill your pot HALFWAY with ingredients when cooking them. Also, we haven’t attempted making other types of oats yet but the steel cut variety is definitely on our to-try list. Once you’ve got your ingredients in the pot, close and lock the lid. The machine will sing you a little tune to let you know when the lid is locked in place. Make sure the steam release handle is pointed in the Sealing position, i.e. towards the back of the Instant Pot. Select the Pressure Cook button (on your machine this might be the Manual button). Adjust the settings to cook on High Pressure for 1 minute. A few seconds after adjusting the settings the machine will start to heat up and build pressure. Now’s a good time to set a timer for 26 minutes and go get ready for the day. 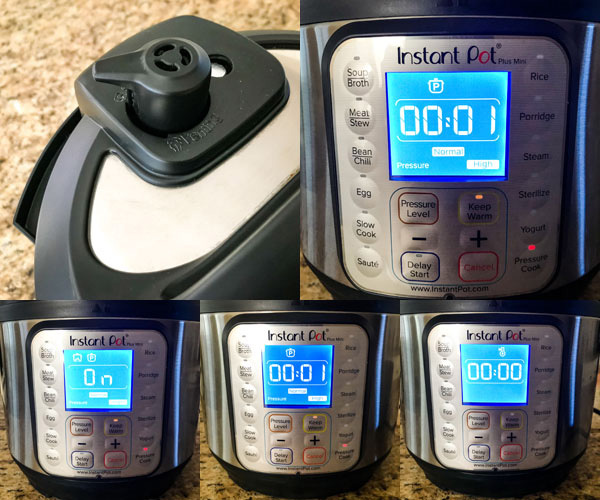 Once the machine reaches pressure (our 3 qt Instant Pot Duo Plus usually takes about 10 minutes) it will beep and begin cooking for the set time, in this case just 1 minute. When the cooking time is up the machine will beep again and the screen will display zero time left. Instead, wait for 15 minutes. Then use a long-handled spoon or tongs to carefully turn the steam release handle and wait for the float valve (silver pin thing) to drop down. If anything but steam starts coming out of the valve – turn it back to the sealing position immediately! One morning in a sleepy fog I accidentally added 3 cups of water instead of 2. When we turned the steam release a starchy oatmeal mixture started spraying ALL over the machine. A week later, I was still discovering little spots of dried oatmeal paste in our kitchen. Press “Cancel” to turn off the machine. Carefully open the lid and turn it away from you as you lift it up. I like to stick the lid in the nifty handle on the side of the machine. When you look inside is there a small layer of water on top? Don’t panic, it’s totally normal and you haven’t done anything wrong. Give the pot a good stir and the water will incorporate into the oatmeal. We like to leave our oatmeal in the pot for a few minutes while we get the yogurt and toppings ready. It usually needs another good stir as the oatmeal does get thicker while it sits. 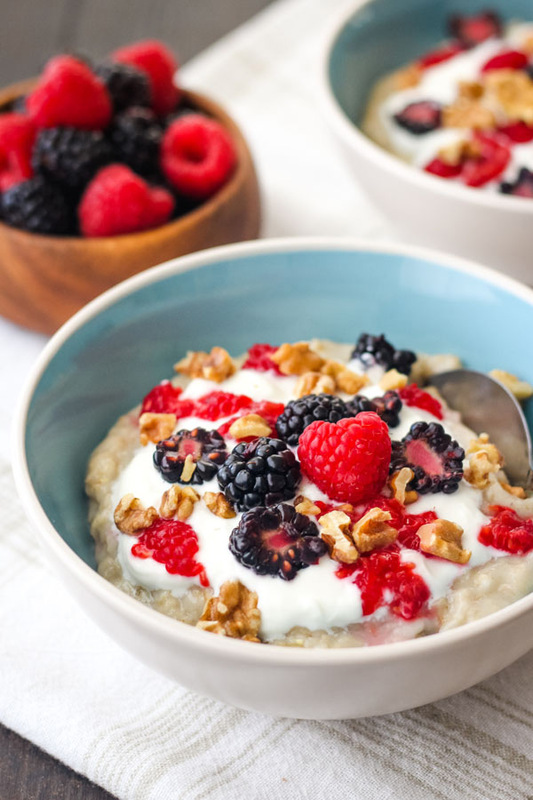 Lastly, transfer the oatmeal to two bowls and top with berries and yogurt. We’re a plain oatmeal house but you can add any sweetener to yours that you want. A drizzle of maple syrup or honey would be delish! I like oatmeal SOOOO much that I often eat it with just a pat of butter (I’m loosely following a keto diet), and two poached eggs, which I cook in the micro. 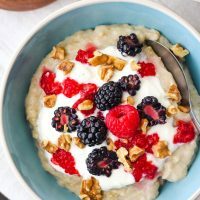 Such a good, filling, down-to-earth meal, and quite frankly, I like oatmeal so much that what most people consider to be two servings is only one hearty serving for just me and my eggs :-). Cooking the oats in the IP (my brands is Yedi, from Yedi Housewares) is super easy, and since I’m retired, I have no time constraints for when it needs to be ready, so I just do other things during the time it’s in the pot, and enjoy it when it’s ready.